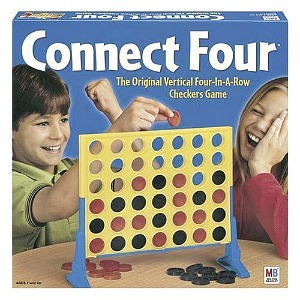 Connect Four (also called four in a row) is a classic two player game that was first launched in 1974 by Milton Bradley (MB Games). As a 70s child, I certainly remember playing this game. The object is simple. Each of the two players takes turns to drop one of their coloured counters into the grid. You must try to get four of your counters in a row, either vertically, horizontally or diagonally. The first player to do this wins. This free, online HTML5 version of the game features red and yellow counters and a blue grid just like the original. Play now against the computer (using your mouse) and bring some childhood memories flooding back! Now, although it would be almost impossible to remember every TV advert from the 80s, after watching this clip I do remember this one - part of it, at least, where Dave shouts "I've got it!" and the girl with the smug face (Sue) responds "where?". "Here", replies Dave, "four in a line". That's the first time I've seen this commercial since my teen years - great memories!